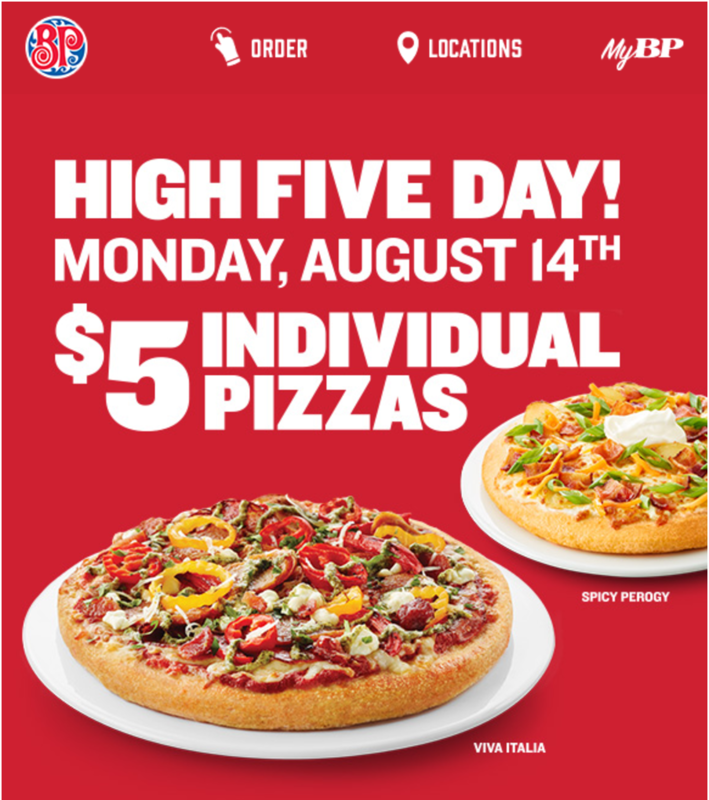 Boston Pizza Canada HIGH FIVE DAY Promotions: $5 Individual Pizzas, Today! Boston Pizza Canada has an awesome HIGH FIVE DAY Promotion available today Only! Boston Pizza wants to thank their amazing guests with $5 gourmet individual pizzas when you dine-in. Choose any gourmet pizza − like their famous Spicy Perogy, our Rustic Italian, or the classic Pepperoni or get creative and make your own four topping pizza for only $5, today. This Boston Pizza HIGH FIVE DAY Promotion is available for dine-in only, today Monday, August 14, 2017. Click here to find Boston Pizza Canada near you. Great deal! Thanks Boston Pizza.